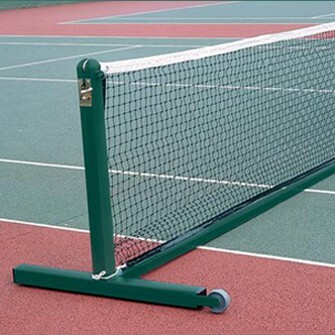 Top quality Portable Tennis Posts. These posts can be wheeled away without the necessity to dismantle the nets. They are easy to assemble and to demount for storage. British manufactured from strong 76mm square steel with green polyester finish, the posts have wheelaway end sections and five interconnecting base bar sections. They benefit from an all-British brass winder mechanism with detachable winder handle. Weight: 70kg per set. When purchasing nets for these posts a 2.5mm Match net is recommended.